SNES Dragon Ball Z: Super Saiya Densetsu (JPN v1.0) "best ending" in 45:32.45 by N?K. 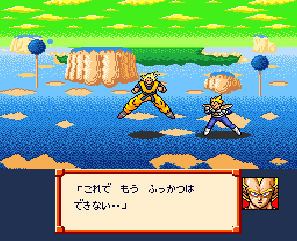 Dragon Ball Z: Super Saiya Densetsu (ドラゴンボールZ 超サイヤ伝説) is a role playing video game and the first Dragon Ball game for the Super Famicom. It was released only in Japan on January 25, 1992. Super Saiya Densetsu is a remake combining two earlier Famicom games of the Gokuden series: Dragon Ball Z: Kyoushuu! Saiya Jin and Dragon Ball Z II: Gekishin Freeza! !, but without the movie characters and anime filler elements that were featured in them. The game follows the rough outline of the Vegeta, Namek, and Frieza Sagas, with various add-ons and edits to make the story fit within the RPG guidelines, such as the inclusion of multi-colored Saibamen and re-colors of Frieza's henchmen and the Ginyu Force members as common enemies.